F Feel the heat and admire the gleam of flames on acrobatic bodies! Fire can be adapted into a variety of performances to add an amazing spectacular to your event. The fire performances in Fuse Circus shows are above and beyond what you would expect! As human beings we are fascinated by fire, dangerous, useful and beautiful. Fire performers treat the flames with understanding and respect, manipulating the flames and working with a unique art form. 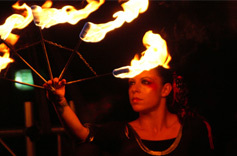 The different apparatus used by fire performers have their roots in a variety of sources. Some are developed from a martial background, like swords, staves, poi, and whips. Others are developed from the original circus apparatus - such as the fire web and the fire hula hoop. Fire performance requires great coordination and quick hand work. It is ideal for outdoor night performance. One of the most popular fire apparatus used by Fuse Circus is the Fire Web. A world first, developed by Pascal Akkerman, this is a special kevlar coated chain and hand loop, which when soaked in fuel acts like a giant wick, and is truely spectacular when on fire. The performance involves the aerialist and a web sitter, who is responsible for spinning the fire web around the body of the aerialist. Fire Fans, linked metal fans with small wicks at the tips of the fingers, are a beautiful and more adapatable form of fire performance, and can be used in dance performance to great effect. Fire Staff is a classic favourite, a staff with wicks on both ends. The performer can spin, throw and balance the staff around their body. Hula hoops can be adapted for fire, with a series of wicks extending outwards from the hoop. Fire performances require stringent safety checks which our production team is well aquainted with and can advise you on. Indoor fire performances are possible,depending on the building construction and fire precautions. Contact Tom Beauchamp to arrange a booking for a Fire act or for any inquiries. We specialise in coordinating acts and production requirements to deliver a fantastic event! Above: A fiery finale! Pascal Ackermann on the fire-web. Showing 9 of 20 images.